asked of historical fiction authors. Personally, I'm always looking for little-known stories about interesting women. Nan Aspinwall of Liberty, Nebraska, captured my imagination the moment I "met" her. I was working on a non-fiction project at the Nebraska State Archives in Lincoln when a researcher smiled and said, "You'd probably be interested in a woman I'm helping another author research. He's doing a magazine article on long distance rides and called asking for more information on Nan Aspinwall." She told me a little about Nan--beginning with the endurance ride that earned her headlines across the nation. Aspinwall rode from San Francisco to New York City in 180 days, "averaging 25 miles per day and did not change horses ..." Once she reached New York, Nan finished the stunt by riding her horse (in a freight elevator) to the top of a twelve-story building. I was intrigued. "What kind of information do we have?" The researcher smiled. "We have her scrapbooks." 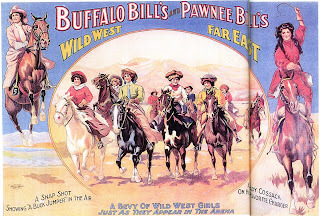 It was Friday, and I was immersed in the other project, but I returned the next week and by page 2 of the first scrapbook (the archive has six), I knew I would be proposing a story about the women of Buffalo Bill's Wild West--a story inspired by Nan Aspinwall. Nan's career didn't intersect with the Wild West until 1908, when she performed with Buffalo Bill's Wild West and Pawnee Bill's Far East Groupe. I've wondered if she's featured on the poster at left. 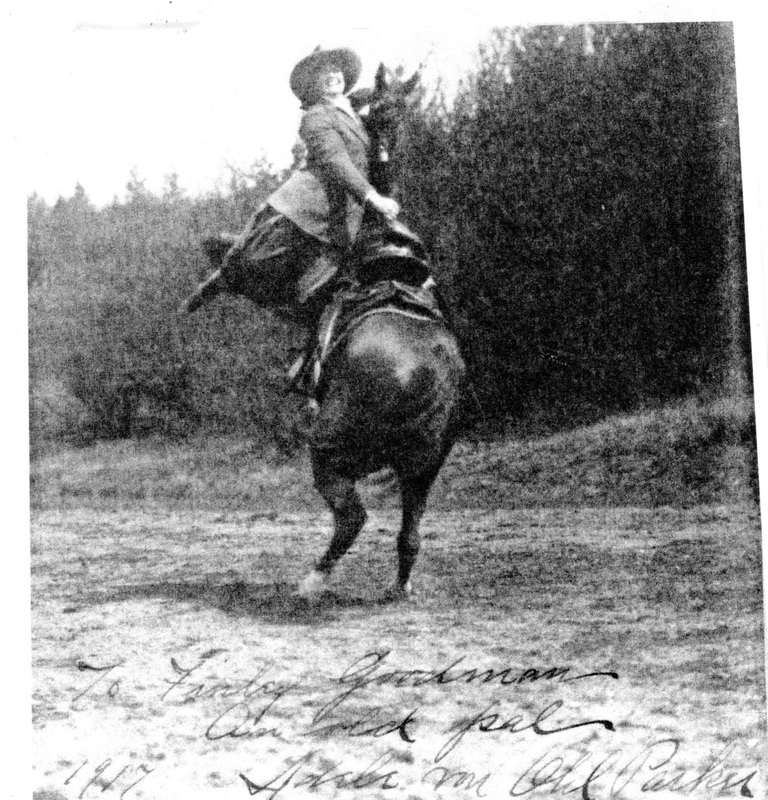 Prior to 1908, Nan was the "Montana Girl," billed as an "expert horsewoman, lariatist and sharpshooter," performing with her husband, Frank Gable. 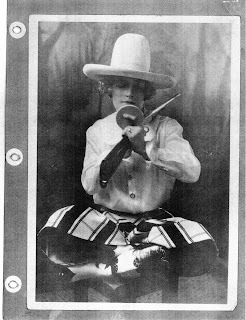 After the Wild West, Frank and Nan of "Gable's Novelty Show" traveled the west (and even performed in Honolulu) with an act that featured "Mrs. Gable shooting with rifle and revolvers and an exhibition of skill with bow and arrow. Frank gives a fine roping, spinning, and trick number. They carry a nice supply of Wild West and African big game films and present these in conjunction with their vaudeville numbers." Part of the shooting exhibition included Nan breaking poker chips held in a closely fitting frame on her husband's head. The Gables toured together until Frank's death in 1929. Two years after Frank's death, Nan donated their shooting gallery equipment to the San Juan Basin Rifle and Pistol Club. She remarried and was living in California when she passed away in 1964. I was twelve years old when Nan Aspinwall died ... wow. The Wild West wasn't all that long ago! One reporter, speaking of Two Gun Nan wrote, "In her the spirit of the West still lives." How about you? 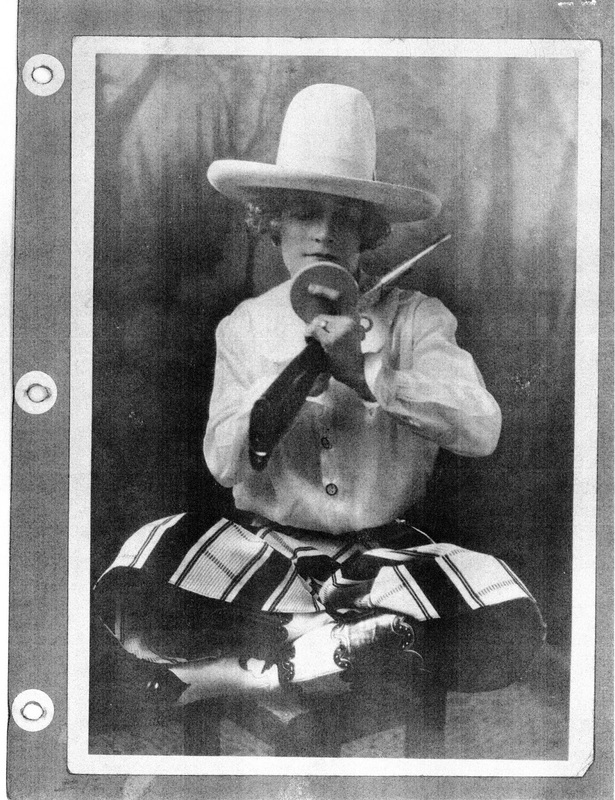 Would you have been the young girl dreaming of performing in Buffalo Bill's Wild West? What you have wanted to do ... trick riding, roping, or shooting? 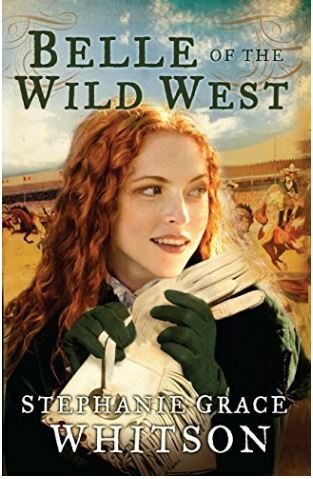 The only child of wealthy parents, Irmagard Friedrich is determined to become famous as Liberty Belle, trick rider for the Wild West. Irma's fiercely controlling mother is just as determined to stop her. But then Irma's doting father arranges for an audition with his old friend, William F. Cody. As Liberty Belle, Irma enters the magical world of the Wild West. Friendship awaits -- and so does Shep Sterling, the handsome King of the Cowboys. Just when Belle has everything she wants, family secrets are exposed, rattling the very foundations of her life and threatening her future. What will Liberty Belle--and others--be forced to sacrifice so that she can live her dream? Nice post! Only in my dreams would I be talented enough to do anything in a Wild West show, but the closest I could imagine is that with practice I might be able to shoot. Though how I'd have the nerve to shoot at my beloved husband's head (or how he'd dare let me!!) I'm not sure! Agree, Connie. I'd never have been a performer of any kind ... let alone precision shooting like that. Even if I don't comment, I always enjoy all of these tidbits of History! This is such a fun blog! Thanks, Becky. I'm so glad you enjoy it! Great stuff. I enjoy learning how authors find fodder for their stories! Thanks for an enjoyable post! 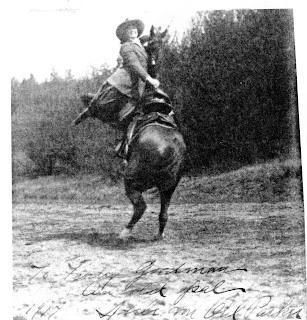 In one of my first novellas, I have the Buffalo Bill Wild West show touring Europe, which it actually did. My Irish heroine attended the show and met the hero, an authentic cowboy. I loved writing about the show. Lots of fun things you can write about. I'm going to have to read your series. It was my hope to end my performer to Paris because of a photo of the Wild West troupe there ... but they never made it. Now I want to read your book! Great post. I would have been a shooter for sure. I always enjoyed shooting a rifle and I was good. But I drew the line at shooting animals. But I guess back then I would shoot if we needed meat. Shooting to feed her family is how Annie Oakley learned to shoot. Like you, when I shoot it's target practice for fun ... if my family had to depend on me for meat on the table, we'd starve LOL. Great post! Thank you for sharing. I would have just watched the Wild West show. I would have been to scared to try an amazing feat like they did. I'm with you ... but I would have loved attending performances. Hi Stephanie! Both Nan & Liberty's stories sound fascinating & exciting! The only thing I ever wanted to do that had anything to do with the Wild West was to perform in the musicals Annie Get Your Gun or Oklahoma, does that count? Thanks for such a fascinating blog & look into the Old Wild West!